Maharishi Global Country of World Peace. 1.World peace has been the long sought goal of many generations. The transcendental Meditation Program provides an effective solution to the problem of world peace. The individual is the basic unit of society. A peaceful individual is the unit of a peaceful world. We can break the big problem of world peace into small problems and solve it on the level of the very nature of the individual. Bring peace to all individuals, and the problem of world peace is solved. within themselves, and spread this nourishing influence in their relationships with others. Until this happens. 4.Happiness is the basis of peace. Unless one is happy, any sense of peace one has will be constantly disturbed. A lasting state of happiness cannot be gained by anything in the outer, ever changing field of life. The minds great thirst for lasting happiness can only be satisfied by contacting the field of infinite happiness, energy, and intelligence—the source of thought deep within the mind. Allowing the mind to experience its more quiet levels naturally structures a permanent state of happiness, harmony, and peace. Scientific research has established that long time practitioners of transcendental Meditation and the TM Sidhi Program including Yogic Flying demonstrate brain functioning in terms of dynamism on the ground of silence, which is characteristic of self referral dynamism—performance in the state of Unity Consciousness—self referral consciousness. This special characteristic of action in silence identified in long term practitioners of the transcendental Meditation Program, has been verified by research scientists at Maharishi University of Management. 5. World peace is within the reach of every nation when happiness is within the reach of the citizens of the nation. As soon as the individuals of every nation begin to live in harmony and peace, world peace will be automatic and permanent. life supporting or life damaging. When people are happy, productive, and at peace within themselves, their surroundings reflect their state of well being, and peace is a natural result. When people are unhappy, restless, and tense, the atmosphere becomes saturated with these life damaging influences and peace is disrupted. National and international conflicts are caused by the collective effect of tensions that individuals generate in their environment. As long as individuals continue to grow in stress and tension, world peace can only remain an abstract and fragile idea. individual is strengthened, so he accumulates less stress and fatigue in daily activity. contributes his share for world peace. Peace is the basis of progress, but progress maintains peace. To be progressive, one must be more creative day by day. Scientific research has shown that transcendental Meditation makes a man more efficient, alert, and creative day by day—maintaining life in progress, providing a foundation for peaceful, harmonious living. In July 1996, on Full Moon Day (Guru Purnima), Maharishi inaugurated a Program to establish a Global Administration through Natural Law, and on 12th January 1997 he inaugurated the ‘Year of Global Administration, establishing a Global Administration with twelve Time Zone Capitals around the world, in order to take full advantage of the administration of Natural Law centred in the life giving sun, whose influence on the earth changes from month to month, creating the different seasons, and constantly maintaining the evolutionary nature of Natural Law for all life everywhere. This has provided a new philosophy of administration, offering new principles and Programs to enrich national law in all countries with the nourishing influence of Natural Law. Maharishis Global Administration through Natural Law focuses on all areas of administration, but has its primary focus on the application of Natural Law in the fields of education and health—total knowledge, ‘fruit of all knowledge—enlightenment—and perfect health for everyone. This will spontaneously make administration free from problems because all problems have their basis in lack of proper education and in ill health. With the establishment of Maharishis Global Administration through Natural Law, administration through national law in every country will begin to experience a lessening of problems in administration, and governments adopting the Programs of Administration through Natural Law will begin to experience support of Natural Law—rise of the dignity of their sovereignty, self sufficiency, and invincibility. The training of Global Administrators in Maharishi Universities of Management and Maharishi Vedic Universities is under way to raise governmental administration through national law on a par with the perfect administration of the Government of Nature through Natural Law, so that every nation rises above problems, and every government gains the ability to fulfil its parental role for the whole population. Maharishis transcendental Meditation is a simple, natural, effortless procedure whereby the mind easily and naturally arrives at the source of thought, the settled state of the mind—transcendental Consciousness—Pure Consciousness, self referral consciousness, which is the source of all creative processes. The experience of transcendental Consciousness develops the individuals latent creative potential, while dissolving accumulated stress and fatigue through the deep rest gained during the practice. This experience enlivens within ones awareness creativity, dynamism, orderliness, and organizing power, which results in increasing effectiveness and success in daily life. EEG coherence increases during the practice of the transcendental Meditation Technique. This indicates greater orderliness of brain functioning. EEG coherence has been found to be correlated with higher levels of creativity, intelligence, moral reasoning, neuromuscular efficiency, and with experience of higher states of consciousness. Reference: Proceedings of the San Diego Biomedical Symposium 15 (1976): 237–247; Psychosomatic Medicine 46(3) (1984): 267–276; International Journal of Neuroscience 14 (1981): 147–151. Scientific research has found that in cities and towns all over the world where as little as one per cent of the population practises the transcendental Meditation Technique, the trend of rising crime rate is reversed, indicating increasing order and harmony. Research scientists named this phenomenon of rising coherence in the collective consciousness of the whole society the Maharishi Effect, because this was the realization of Maharishis promise to society made in the very early days of the Movement. The Maharishi Effect establishes the principle that individual consciousness affects collective consciousness. 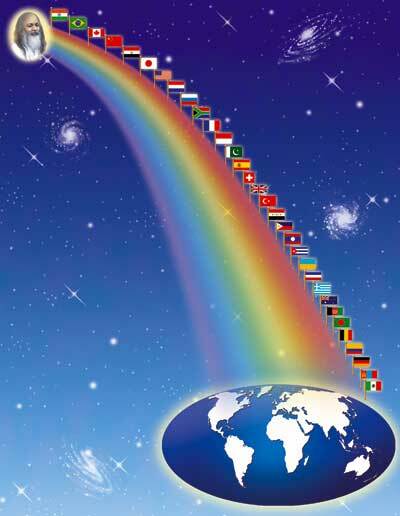 The success of Maharishis Global Administration through Natural Law in bringing peace to the individual has given rise to a global undertaking to effortlessly create an ideal society—Heaven on Earth—in which life will be characterized by ideal education, perfect health, dynamic progress, and peace and harmony in the family of nations. The appearance of spreading areas of EEG coherence during the TM Sidhi Program is entirely analogous to the neurophysiological principle of recruitment, whereby more and more individual elements are brought into simultaneous action to accomplish more and more difficult tasks—more and more Laws of Nature are spontaneously recruited to fulfil the desire without resistance. Practitioners of the TM Sidhi Program with the most stabilized transcendental Consciousness (the simplest form of awareness) were found to have maximum coherence of brainwave functioning as measured by EEG, indicating maximum mind body coordination. This subtlest level of consciousness is a field of all possibilities, correlated with maximum creativity and experience of the ‘Siddhis—procedures for producing effects in the body and environment by mere intention of the mind, which results in increased ability to fulfil desires. Reference: Scientific Research on Maharishis transcendental Meditation and TM Sidhi Program—Collected Papers, Volume 1 (1977): 102. The TM Sidhi Program is an advanced aspect of transcendental Meditation. It trains the individual to think and act from the level of transcendental Consciousness, greatly enhancing the coordination between mind and body, and developing the ability to enliven Natural Law to support all avenues of life to fulfill ones desires. In 1976, with the introduction of the more advanced TM Sidhi Program, including Yogic Flying, a more powerful effect of coherence in collective consciousness was expected. The first major test of this prediction took place in 1978 during Maharishis Global Ideal Society Campaign in 108 countries: crime rate was reduced everywhere. This global research demonstrated a new formula: the square root of one per cent of a population practicing transcendental Meditation and the TM Sidhi Program, morning and evening together in one place, is sufficient to neutralize negative tendencies and promote positive trends throughout the whole population. Yogic Flying demonstrates perfect mind body coordination and is correlated with maximum coherence, indicating maximum orderliness and integration of brain functioning. This coherence indicates action from transcendental Consciousness, the Unified Field of Natural Law, where infinite organizing power is lively. Even in the first stage of Yogic Flying, where the body lifts up in a series of short hops, this practice gives the experience of bubbling bliss for the individual, and generates coherence, positivity, and harmony for the environment. Research has shown that groups of individuals practicing Yogic Flying—all enjoying very high brain wave coherence—create coherence in collective consciousness, and generate a unifying and integrating effect in the life of society. This results in a decrease of negative trends throughout society—such as crime, accidents, and sickness—and an increase in positive social, economic, and political trends. Scientific studies on this phenomenon have demonstrated that a group of at least 7,000 Yogic Flyers can produce this coherence creating effect on a global scale, reducing violent and negative trends worldwide. The Global Maharishi Effectt was created by the group practice of 7,000 Yogic Flyers (7,000 being approximately the square root of one per cent of the worlds population) during three large ‘World Peace Assemblies which were held over a period of two to three weeks in the USA, Holland, and India. The secret of the Global Maharishi Effect is the phenomenon known to Physics as the ‘Field Effect, the effect of coherence and positivity produced from the field of infinite correlation—the self referral field of least excitation of consciousness—the field of transcendental Consciousness, which is basic to creation and permeates all life everywhere. Every government must have a group of Yogic Flyers—‘A Group for A Government—in their capital city to bring success to the government. With the establishment of ‘A Group for A Government, national consciousness will become aligned with the Government of Nature, the evolutionary power of Natural Law, which administers everything in creation with perfect order. With the support of Natural Law—positive trends and harmony rising in national life—the problems of the nation will disappear, as darkness disappears with the onset of light. During the period 1979–1986, the number of participants in Maharishis transcendental Meditation and TM Sidhi Program at Maharishi International University in the U.S. frequently exceeded the required amount to create the Maharishi Effect for the U.S. During those months, the U.S. actions toward the Soviet Union became more positive, as indicated by time series analysis of an independent data bank. When the number of TM Sidhi Program participants was at its highest level, the Soviet actions toward the U.S. also improved. Reference: Proceedings of the American Statistical Association, Social Statistics Section (August 1990): 297–302. During Maharishis ‘World Peace Project of October–December 1978, experts in Maharishis TM Sidhi Program went to regional trouble spots around the world to demonstrate the ability of group practice of this Program to radiate a calming influence in the turbulent areas of Lebanon, Kampuchea, Iran, Rhodesia (Zimbabwe), and Nicaragua. During this time period, in comparison to a baseline period prior to the project, an independent data bank showed reduced hostile acts and increased cooperative events in those areas and among nations involved in these conflicts. Reference: Scientific Research on Maharishis transcendental Meditation and TM Sidhi Program—Collected Papers, Volume 4 (1989): 2532–2548. Crime decreased significantly during periods in which the number of group participants in Maharishis transcendental Meditation and TM Sidhi Program exceeded the square root of one per cent of the population of these three capital regions—Metro Manila, Philippines (August 1984–January 1985); Washington, DC, USA (October 1981–October 1983), Union Territory of Delhi, India (November 1980–March 1981). Reference: The Journal of Mind and Behavior 8 (1987): 67–104; and 9 (1988): 457–486. Two studies using time series analysis found significant reductions in violence in the United States and Canada during periods when the number of participants in the group practice of Maharishis TM Sidhi Program exceeded the square root of one per cent of the North American population. Reference: Social Indicators Research 22 (1990): 399–418; Dissertation Abstracts International 50(5) (1989): 2203B. This study shows that during three experimental periods when 7,000 experts (the square root of one per cent of the worlds population) practiced Maharishis transcendental Meditation and TM Sidhi Program, there were significant global reductions in international conflicts and terrorism. Reference: American Political Science Association (1989). During Maharishis World Peace Project of October to December 1978, in comparison to a baseline period prior to the project, an independent data bank showed reduced hostile acts and increased cooperative events internationally. This worldwide effect was due to the fact that the trouble spot areas influenced by the visiting groups of TM Sidhi experts were the key areas of international conflict and interaction at this time. Reference: Scientific Research on Maharishis transcendental Meditation and TM Sidhi Program—Collected Papers, Volume 4 (1989): 2532–2548.